DUB-H7 USB Hub - ACE Peripherals ::: Completing I.T. With the DUB-H7 7-Port Hi-Speed USB Hub, you can conveniently add more USB 2.0 ports to your computer. Now you can connect up to seven more USB peripheral devices – such as digital cameras, printers, external hard drives, mice, keyboards, flash drives, and tablet computers – to your notebook, laptop, or desktop computer. USB 2.0 technology supports data rates of up to 480 Mbps2, which means that you can enjoy much faster connection speeds compared to previous USB standards. The DUB-H7 features two black Fast-Charge ports that are designed to feed an increased charging current of 1.2 A to connected devices, when the DUB-H7 is in Fast Charge Mode. This makes it perfect for charging power-hungry mobile devices like the iPad®, as these devices have high-capacity batteries that require higher charging currents to recharge quickly and effectively. Connect this small device to a power outlet and an available USB port on your notebook computer and your installation is complete. It’s that simple. Now you can connect up to seven additional USB devices to your laptop, notebook, or desktop computer. The DUB-H7 is designed to fit into any notebook bag, and the compact size of the device will allow you to conveniently carry it with you wherever you go. 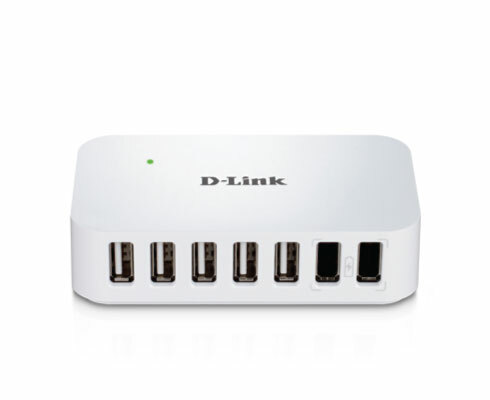 Experience the freedom and convenience of portability and expandability with the D-Link DUB-H7 7-Port Hi Speed USB Hub.